As we mention elsewhere, planning for your retirement does not just include focussing on building up your superannuation balance, but ensuring that you have adequate assets in total to meet your retirement income needs. However, outside home ownership, superannuation is already the second most substantial asset held by Australian families, and its importance will grow over time. Obviously, it is also the only investment which is specifically structured to provide you with financial support in retirement and it provides a very tax effective environment within which to grow your investments. The following section provides you with a summarised introduction to superannuation in Australia, including an explanation of how you can contribute to superannuation, how superannuation is taxed and when you can access your funds. The focus of this website is very much upon providing information and support for fully and partially self-funded retirees, and helping them navigate a sometimes extraordinarily complex superannuation and social security system. At the present time, according to the most recent ABS statistics, about 48% of the retiree population, about 1.6M individuals, are either fully or partially self supporting (see the chart below). To be frank, superannuation is overly complex, largely for reasons of politics rather than good policy, and unless your situation is relatively simple you cannot be expected to have a full appreciation of how superannuation affects you and your available options. For that reason, we strongly recommend that you consider seeking experienced financial planning advice earlier rather than later, and certainly in your fifties. 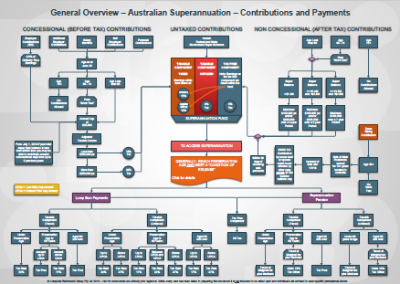 Just how complicated is illustrated by the schematic or "simplified" flow chart of superannuation which we have constructed; and this is not a complete overview. It doesn't for example cover certain specific areas, such as co-contributions, and the departing Australia superannuation payments (DASP) available to some temporary residents. It is not intended as an alternative to discussions with either your financial advisor or Centrelink, but to provide some help in putting the whole system in perspective.